It is quite a common habit for many net users to do cross checking on a certain terminology or subject while reading an article, downloading a file or typing a proposal report. Users normally will open a new browser and start browsing in the net to look up the item they need. To streamline the search process and reduce the browsing time, users now can try this new software utility, KallOut, which allow users to kick off a web search from any word in all Microsoft Office products right from within the Office applications. KallOut is a useful application that collaborates well with all Microsoft Office applications. Users can download the application via the link here. After installing, you will see a blue icon when you double-click or select any word or phrase within any Microsoft Office program. Once you point your mouse to the tiny icon, a pop up KallOut search menu will appear. The pop-up menu displays various search options. Users are allowed to choose from a list of search engine providers such as Google, Yahoo, Technorati and Live Search. Users also can search reference sites like Google Maps, Wikipedia, Dictionary.com, YouTube (for video), Flickr (for photos) and various other commerce sites, databases as well as news sources. The search result for the word or phrases highlighted will be displayed in an on-screen window. Users can click to go to the originating web source for the information. KallOut is smart and context aware. It has intelligence ability to identify your search requirements. For instance, if you highlight an address, KallOut’s first search option will be a map or satellite view; likewise, a movie title will likely display options from YouTube, etc. Besides Microsoft Office programs such as Outlook, Excel, Word, PowerPoint and WordPad, KallOut is also compatible with Adobe PDFs, Facebook and various browsers such as IE and Firefox. 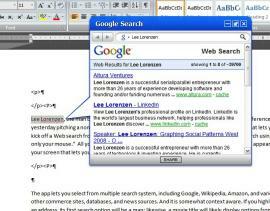 KallOut features an easy-access approach to do net searches. Users who are familiar with this tool will enjoy it very much though it may be a great challenge to adapt to this new approach!